The Kingdom of Loango, also known as the Kingdom of Lwããgu, was a pre-colonial African state from approximately the 15th to the 19th Centuries in what is now the Republic of Congo. At its height in the seventeenth century the country stretched from Cape St Catherine in the north to almost the mouth of the Congo River. Its inhabitants were a branch of the Bakongo. Missionaries who visited the Loango coast at the end of the nineteenth century often called the people of Loango Bafiote, and their language Fiote. Their ethnic name today is usually given as Vili or Bavili. The Provinces of Loango, Ngoyo and Kagongo seceded very early from the Kingdom of Kongo to form independent kingdoms. In the 11th century, the Bouvandji party, supported by warriors and blacksmiths, ruled a state called Loandjili (from "loa", the political power, and "ndjili", the squirrel as the symbol of power). The Bouvandji were eventually expelled and the Kingdom of Loango emerged in the 13th century. "Ngo" means "panther", Loango being therefore "the Royal power with the panther as its totem". - Me N’Go Kwangu (aka Setekana). 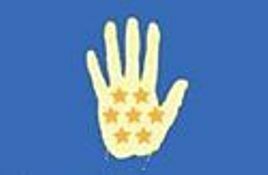 The modern flag of the Kingdom of Loango has a light blue field in the centre of which is a open hand containing seven yellow stars in the palm. - a figure [I guess, a star] represents the mouth of the sovereign, used to educate the people and deliver an impartial justice. Succession to the throne is quite complex in Loango because of succession wars involving different tribes. Elected on 29 August 1996, King Moe Taty I had his coronation delayed until 13 November 2000. He passed away on 11 August 2007 but the "main crown prince", his nephew Moë François Fouti-Loemba, has not yet been crowned. Further detailed information on the Kingdom of Loango is available on its official website. The Kingdom has a new king. Moe Makosso VI was invested on 29 August 2009 at Diosso as the 17th king of the Loango. Flags of the Loango can be seen here and here.